Auto Market Weekly Summary - Cox Automotive Inc.
Last week was a big week of data as government agencies provided more delayed insights into December and last year’s fourth quarter. We also received new readings on consumer sentiment and tax refunds as well as initial sales reports on the February new vehicle market. The mixed-bag economy: The economy grew better than expected in the fourth quarter, but at a slower pace. Much of the upside surprise was a result of inventories being built up due to trade anxieties, and that build up will likely hurt growth in the first quarter. The consumer slowed down spending in the fourth quarter, but part of the strength was in autos, which we know hasn’t been repeated so far this quarter. The consumer cut way back in spending in December as the shutdown and stock market correction hurt confidence. However, the average consumer continues to see strong gains in incomes. That means that savings improved at year end and could be spent this year as confidence improves. At least one survey indicates that consumer confidence is rebounding, but there are mixed signals with Consumer Sentiment weaker than Confidence, and with plans to purchase vehicles, homes, and appliances all down. Housing did not support economic growth in 2018, as new construction only saw weak growth and existing home sales fell. The new construction data in December seemed weak, but the underlying data on permits suggest some growth ahead or at least not further declines. Likewise, pending home sales improved in January, which could be an important signal for better existing home sales this spring. New vehicle sales disappoint: Based on the initial automaker sales reports, February did not see the improvement we expected as a result of the end of the government shutdown, less bad weather, and rebounding consumer confidence. 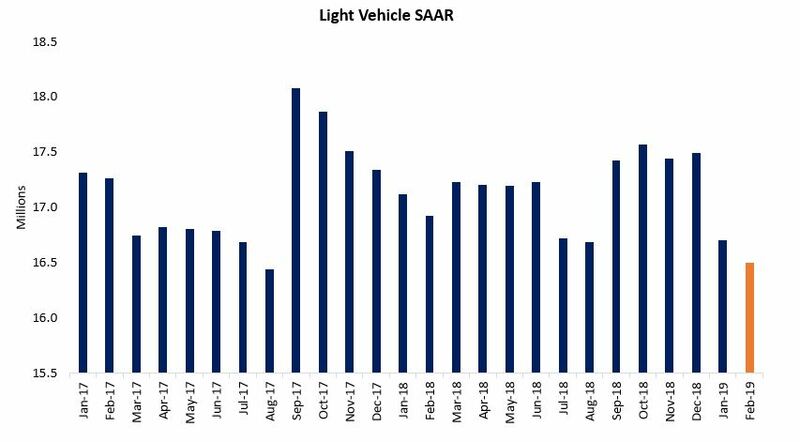 The SAAR was 16.5 million, unchanged from the very weak January and down from last year. Tax refunds gain steam: Tax refund data looks better now that filers eligible for tax credits are now receiving refunds. The average refund is up 1.3 percent over last year as of the end of February, but total refunds and total refund dollar amounts are down. Looking ahead: Regarding tax refunds, look for more detailed analysis and implications for the auto market this week as another update arrives. We will do a deeper dive on February’s new and used vehicle sales. The Manheim used Vehicle Value Index will be published on Thursday. We’ll have more belated government data from December and January as well as February employment numbers. And, stay tuned for the Q1 2019 Cox Automotive Dealer Sentiment Index which will be published on March 11.